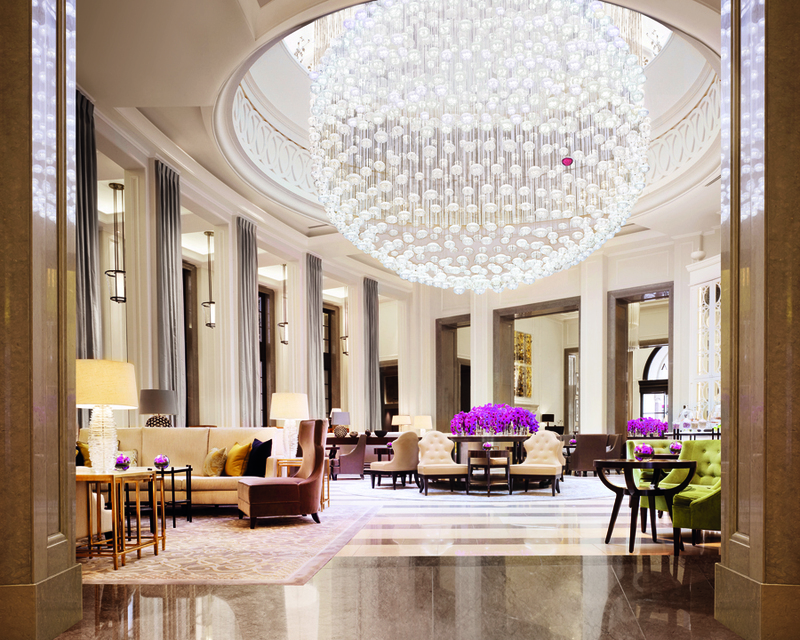 Stunning, almost surreal, in style and size, a stay at London’s Corinthia Hotel is well worth it if only for its superb spa spanning four floors. Displaying dramatic Calacatta and black Italian marble, roaring modern fires and leather and dark oak furnishings, the facilities include a silver steel indoor pool, a central, all-enclosed glass amphitheatre-style sauna, vitality pool with water massage jets, a black mosaic steam room, an ice fountain and heated relaxation beds. Close to the River Thames and on the doorstep of Trafalgar Square, Westminster and Covent Garden, this luxury London property with a distinct contemporary palatial ambiance was opened four years ago. Transformed from a grand Victorian building dating from 1885, a dazzling, 1,000 crystal-bauble, Full Moon Baccarat chandelier created by Chafik greets one in the lobby lounge where pistachio and rose leather armchairs beckon guests to enjoy a cocktail or the hotel’s traditional afternoon tea. On one wall is an innovative, framed artwork, decorative birds shaped from fragments of ordinary maps by Claire Brewster entitled ‘The Birds Are Coming’ while nearby is a glass fronted, floor-to-ceiling cupboard filled with assorted tea caddies. A central table festooned with flower arrangements by in-house florist, Ercole Moroni, adds splashes of color to the scene. Even the elevator doors display the hand of artistry, with the imprints of leaves from trees along nearby Northumberland Street engraved on them. Traditional afternoon tea makes for a special treat with 23 varieties blended by Harney and Sons, served on Edward’s bone china, under various categories – Flavored and Herbal, Black Blends, Black Single Estates, Green, Oolongs and White and Historical (the Winston Churchill, a Lapsang Imperial, was particularly rich and malty). Laurent-Perrier champagne, both brut and rose, complement the package. Emphasis is on British ingredients with several varieties of sandwiches such as Loch Var smoked salmon, cream cheese and chives; Severn & Wye smoked trout and cucumber; and Mrs. Kirkham’s Lancashire cheese and Picalilli. Desserts are a story onto themselves, with chapters entitled ‘Dark and Stormy’ and ‘Bramble.’ I couldn’t resist ordering more Pistachio Chantilly, white chocolate and pistachio dacquoise, as well as crispy topped choux, roasted white chocolate, cremeux and raspberry. Beyond the lounge to left and right respectively are the hotel’s two main restaurants – the flamboyant, Italian-styled Massimo, with its rows of candy-striped pillars and dazzling floor designs by David Collins; and the Northall, created by GA Designs. The latter is reached through a connecting hallway where a flower shop and a Harrods boutique selling pastel-colored boxes of chocolates and scented candles is located. Dinner in the Northall is thoroughly British, with Cumbrian beef, Dover sole and game birds from the Lake District, Sussex, Dunfries and Galloway among the items. I recommend the shellfish bisque with crab and crayfish ravioli as a starter – light but wholesome in its flavors with digestive aids supplied by a fine mix of herbs including lemon verbena and basil – and the roast grouse with orange infused pearl barley risotto, puffed rice and buttered kale with prune jus as a main. I have become quite a fan of barley risotto, with its wonderfully nutty texture and wheaty flavor. It seems to be a firm favorite of many kitchens nowadays together with in-vogue kale. No better way to finish the evening than with vanilla and salted caramel cheesecake, with soft brownie, apricot puree and walnut ice cream. A comprehensive breakfast buffet is displayed on a horseshoe-shaped platform under a large candlebra in a room adjoining the Northall. Sheets of gold-colored, metallic-like paneling adorn the ceiling, with mirrored walls below and tall pillars. Interestingly, among the foods offered are Chinese dishes such as dim sum, as well as a rare jewel of breakfast buffets – health-giving bee pollen grains. The range of fruit and fish is impressive with three different types of berries and salmon, mackerel, trout and halibut to choose from. Our room was spacious, with a high ceiling and a contemporary, chic design. Satin bedcovers, a tufted headboard and decorative cushions reflected a sense of timeless elegance. A large walk-in wardrobe and separate shower and bathtub completed the ensemble. A lovely touch was a delicate black box containing luxury chocolates by William Curley left on the bed every evening. The hotel also offers seven penthouses, individually designed according to different themes, such as music, writing, exploring and acting. 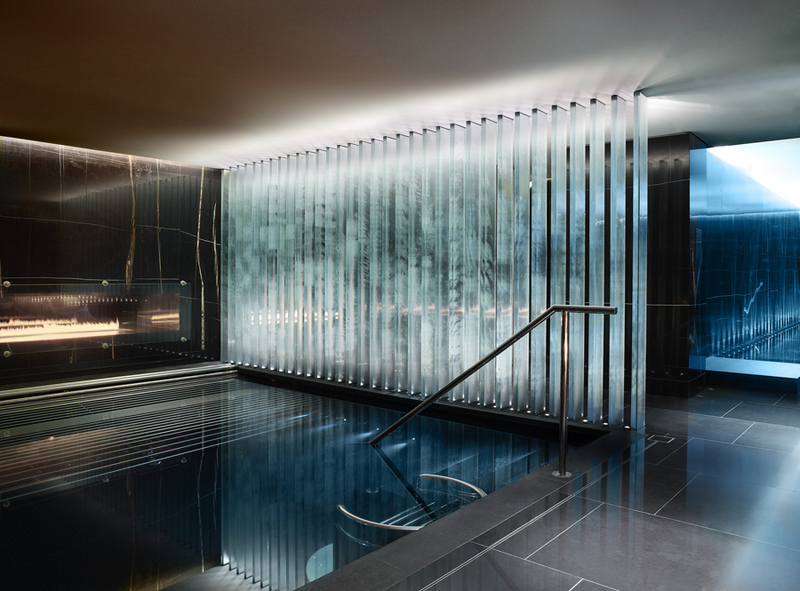 A highlight of the Corinthia, managed by Renaud Gregoire, is its ESPA Life spa featuring 17 treatment rooms. For something different, we tried a bamboo massage, the instrument being used as an aid for joint release, as well as an ‘ESPA Time,’ which includes a consultation and full-body massage and an invigorating, deep tissue facial. There is also a 24-hour gym. Being so close to so many of London’s visitor highlights including the lively West End, convenience is reason enough for staying at the Corinthia. Add to this the choice of two very diverse restaurants, a fine cocktail lounge and a wonderful spa and it’s hard to find a reason not to stay here. Posted in Luxury HotelsTagged baccarat, city breaks, Claire Brewster, Corinthia Hotel London, Covent Garden, David Collins, Dunfries, England holidays, ESPA Life spa, European destination, fine dining restaurant, Galloway, Lake District, London afternoon tea, London luxury accommodation, Renaud Gregoire, River Thames, spa, Sussex, Trafalgar square, Victorian building, Westminster, William Curley chocolatesBookmark the permalink. Copyright 2014 ©World Itineraries. All rights reserved. No part of this publication, text or photographs, may be reproduced, stored in a retrieval system, or transmitted, in any form or by any means without the prior permission in writing of the publisher, nor be otherwise circulated in any form of binding or cover other than that in which it is published and without a similar condition including this condition being imposed on the subsequent purchaser.﻿ If you are interested in publishing any content or photographs, please contact us (see details in About section).